Athabasca's Going Unmanned is set in a youth offender jail in Alberta, Canada and tells the story of three incarcerated youth and the corrections staff who work with them. The story centres on an escape plot hatched by the inmates and ultimately examines the needs of incarcerated youth and the prospects for offering them programming with transformative potential. Based on extensive research with 'at-risk' youth and incarcerated youth, the play addresses a range of real-world issues with sociological, criminal justice, policy and educational implications. Moreover, issues of race and ethnicity feature prominently. The play raises many challenging issues at the level of fantasy and imagination in order to draw attention to and elicit discussion around these controversial issues. 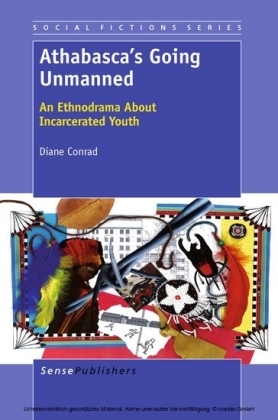 As a means of disseminating the research, ethnodrama aims to engage a more diverse audience and engender empathic understandings of the experiences of incarcerated youth leading to more constructive attitudes regarding their needs, with the potential for radically re-envisioning social relations. The book is an ideal supplemental text for courses in education, sociology, criminology/ criminal justice, theatre arts and arts-based research. The fictionalized format invites readers to engage with complex questions without relying on an 'authoritative' text that closes off meaning-making. Rather, readers are invited into the meaning-making process as they engage with the play and its alternative endings. Diane Conrad is Associate Professor of Drama/Theatre Education in the Department of Secondary Education at the University of Alberta. The research upon which the play is based, in 2006, was awarded the Social Sciences and Humanities Research Council of Canada Aurora Prize recognizing a new researcher building a reputation for exciting and original research in the social sciences or humanities.